Last fall, I flew to New York under the guise of supporting Sam Singer while he ran 26.2 miles in the freezing cold wind through all five of the city’s boroughs (aka the New York City Marathon or something). Meanwhile, I engaged in a week-long, full-on eating marathon. After several days of eating out in New York, my tight jeans proved that I emerged triumphant. New York City harbors most food trends before they make it to the rest of the country. With my New Yorker friends in tow, the culinary education turned out to be very enlightening. Without further ado, here’s the food you’ve been missing by not living in New York. And if you live in New York and haven’t tried these, get thee to a food truck or gourmet diner. Immediately. Grits are a mashed up, grainy, tasteless staple of the South. On late nights and early mornings in my hometown in Texas, my best friend would eat them out of a ceramic bowl at the all-night diner institution known as the Waffle House. The Waffle House (which never closes) is always full of truck drivers, night owls and those for whom IHOP is just too fancy. And yet, so far from Texas, here they were again. Not the truck drivers, but grits. Mushy polenta-like goop, except now they were being served in a Brooklyn gastro pub, dressed with fancy seasoning — and the locals were eating them up. For a side dish, collard greens, the leafy green vegetable also found in the South, was on nearly every menu I saw in New York. The day after my gastro-pub trip, my friends in the city take me to a diner in Williamsburg for brunch. We wait in the rain (standing outside in the cold waiting for food is a trend in itself) for an hour before sitting down. I open the menu to see huevos rancheros and grit cakes. “I think we’re at peak donut right now,” Nick said confidently, later that week while he inhaled his artisan burger. Apparently, it’s not worth eating a donut at all unless it’s a Dough Doughnut. This store sells donuts with flavors and icings like chocolate with earl grey or toasted coconut. Previously unbeknownst to me, I had actually eaten one earlier that day while trying to escape a rainstorm near Union Square. 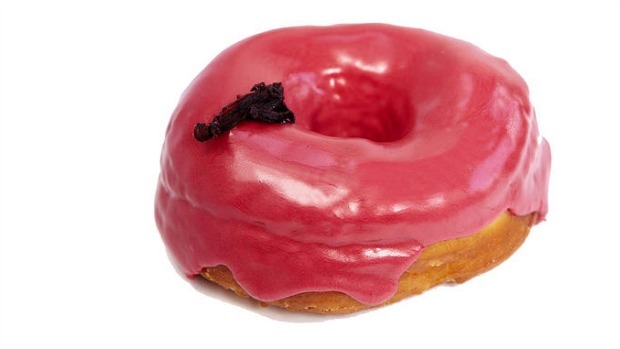 I ducked into a café called Birch; at the counter, I couldn’t resist the red, beautifully named Hibiscus donut. It was so indulgent and rich that it could have fed me for a week. Near the end, I felt ill at having consumed a red brick of sugar and fat. But I also felt happy. Whatever their secret is, it is incredibly effective. While sitting down to a bowl of spicy miso ramen at Momofuku’s famous Noodle Bar (so last year, but still delicious nonetheless), my brother ordered a Coca Cola. The waiter brought over a glass Coke bottle. “Retro,” I say. “Mexican,” he replies. American Coke has corn syrup (which has become so maligned that it is basically as evil as crack cocaine), whereas Mexican Coke has good ol’ plain sugar and is deemed healthier. I saw Mexican Coke on a few more menus throughout my trip. It’s not as evil as actual cocaine, but it’s definitely as addictive. Despite the autumn weather, Nick insists we visit Ample Hills Creamery for the best ice cream in the city. We did not leave disappointed, mostly because the staff allows you to sample as many flavors as you desire before you decided which to purchase. No Sleep Till Pumpkin (rich coffee ice cream with pumpkin cake) – Verdict: I did not try this, and now I must live with this decision for the rest of my life. If you go there, do not make the same mistake I did. Order it. In the end, I settled on the Salted Crack Caramel. Verdict: the stuff is appropriately named. I will never be the same. “’Farm to Table’” is huge,” Nick tells me, right before he mentions that he now has three chickens living in the backyard of his Prospect Heights apartment. “Where is farm to table big?” I ask. He rolls his eyes. Everywhere. It’s everywhere. The trend of only serving locally grown food has taken over the city. For those not in the know, farm-to-table means the food is locally-sourced and usually comes from a specific farm associated with the restaurant – and it does seem to be a selling point for nearly every restaurant. Apparently you haven’t lived until you’ve clutched your iced coffee (sweetened with maple syrup instead of simple sugar syrup) with your gloved hands and sipped your icy drink in the freezing cold breeze of the city. When I meet up with my friend Marie, we’re both wearing matching red beanies, jeans and brown boots. It’s brutally cold outside and we stop briefly to pet a few passing dogs before ducking into a warm café (the counter is covered in lots of bagels – the New York staple remains). To my surprise, she orders an iced coffee. Another friend, Elly, says she drinks iced coffee year round. In London, it’s nearly impossible to even find ice in cafes during the height of summer which is reason enough to repatriate back to the States. And forget plain sugar syrup. Maple syrup is superior. Just try it. Go on. Be bold. Artisan hotdogs. Gourmet mac and cheese. Shrimp grits.Taking away the grubby factor from the guilty pleasures has made this my favorite trend, bar none. At a fancy restaurant (white tablecloths!) in the Village, I make the unfortunate mistake of ordering corn chowder with shrimp. Sam Singer ordered hamburger macaroni and cheese to go with his sparkling water and I spent the entire meal trying to distract him so I could sneak in more bites. Nick tells me that it’s hard to pinpoint food trends in New York because the city is so big. And if you want Mexican Chinese, head to Mission Cantina in the East Village. We start with queso and chips, move onto mole chicken wings with vinegar and sesame seeds and then finish it off with fish tacos. Also in the city, but missed by me were Korean tacos (which started in a San Francisco food truck but have officially arrived in New York) as well as pretzel buns (“very big right now” says Nick) and the incomprehensible “ramen buns” – sides made up of the noodles. On my final night in the city, I stood on the subway platform at 14th street very full, very satisfied, and super smug. I stood there thinking about how I had eaten the most delicious, eclectic food, but also how — for the first time ever — I had visited New York without seeing a rat in the subway. Not 10 seconds later, a tail-less rat scampered along the tracks. Some things never change. New York will always be searching out the latest trends, fusing things you never thought could be fused and making them so delicious you come back again and again – until you notice that your favorite cupcake place has been replaced with a cronut bakery, which is then replaced by a doughnut shop. None of it matters, though. Artisan high-brow gourmet farm-to-table or not, the rats are still going to eat it. And I’m still going miss New York. P.S. I have no idea why there are weird links embedded in this post. I did not put them in.